A few months ago I treated myself to something really fun. I took a solo trip (!!!) to New York City for a sewing workshop with Heather Ross. Although I reserved my spot many months in advance, I tried to back out in the weeks before the trip because I was struggling with the idea of spending money on myself. In the end, nobody filled my spot or took my hotel reservation. So Mr. Great found me some frequent flier miles and convinced me to go. I'm very glad he did. The trip was inspiring and empowering in ways I couldn't have imagined. I flew into Newark, took the train to Penn Station, and walked to the Chelsea Lodge, a cute little place that's surprisingly affordable, perfectly situated in a great neighborhood, and has everything a single traveler needs in NYC (the toilet is down the hall, but that worked out totally fine). I then jumped into a cab, rushed straight to Broadway, bought a hugely discounted ticket to Chicago, enjoyed a fun show that nobody in my family would enjoy, and walked around Times Square by myself. At this point, I was already feeling pretty emboldened -- I'd found my way around flawlessly and was making the most of every moment of my time. The next day I ventured out in the rain. I walked all over the place, logging many miles in my very wet boots. At one point I needed to dry off, so I popped into Barneys for a makeover. I discovered Beauty is Life cosmetics, which are gorgeous and expensive and made me feel like the fanciest mom on the planet. I bought the kids some souvenirs at FAO Schwarz. I walked through wet Central Park. I window shopped on Madison Avenue. I took the subway. After lunch, the weather cleared up a bit, so I hiked the length of High Line, a park along an old elevated freight rail line. It was one of the coolest places I've ever been. Gorgeous views of the city (and even the Statue of Liberty! ), cool public art, an amazing transformation of something industrial into a beautiful public space. I can't wait to take my family there! Then came the sewing part of the weekend. We began with a private, champagne-included shopping evening at Purl Soho, which was every bit as incredible as the website suggests. There I met our lovely hosts for the weekend -- the very talented Heather Ross and Liesl Gibson of Oliver + S fame. And I met a bunch of ladies who love to sew and knit and create. There were fashion industry professionals, at least four sewing teachers (Annabel of Little Pincushion Studio and three ladies of Fancy Tiger Crafts), women who had been to several Heather Ross sewing workshops, and women who aren't fazed by zippers, interfacing, patterns with more than six pieces, and advanced sewing techniques. 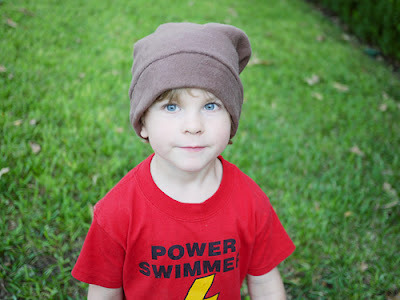 And, like me, there were a few moms who sew primarily for their lucky kiddos (just check out Allie's blog at Crozette for an impressive example, although she sews quite a bit for herself as well). 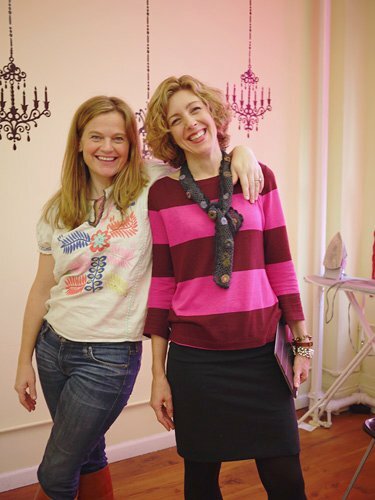 Saturday morning, Heather and Liesl guided us through fabric shopping in the New York garment district. 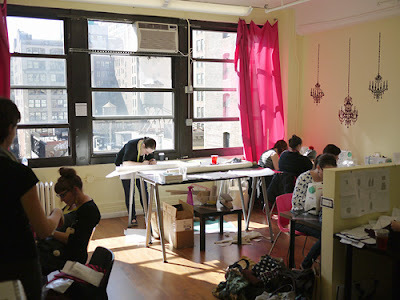 They showed us around Mood of Project Runway fame and pointed us to other can't-miss shops (Spandex World!). 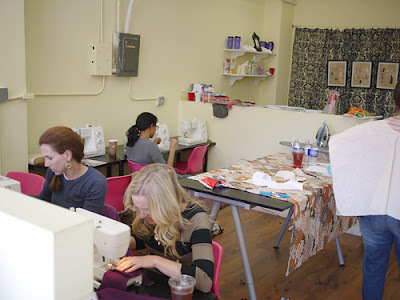 Then we began sewing in the bright and cheerful Sewing Studio. As other workshoppers jumped right into their fantastic projects, I began to wonder if I wasn't making the most of my time and the once-in-a-lifetime opportunity to get assistance from two sewing greats. I had not brought a project with me (after all, I had planned not to attend, and I didn't have a project in the works). 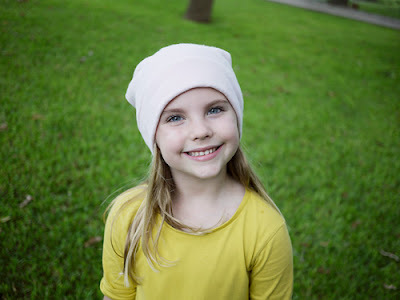 But Heather suggested some easy projects, so I tackled one of those --- slouchy winter hats using deliciously soft cashmere fleece from Mood, with yarn pom-poms, one for each kid. I finished the hats with plenty of time to spare. As it turned out, I was glad to have a project that did not require too much concentration and that left me with some free time because it allowed me to chat with others more than I would have otherwise. I talked with Heather and Liesl about how they learned to sew and how they manage to fit it in with their busy careers and motherhood. I helped a friend rip out stitches while she tended to her baby. 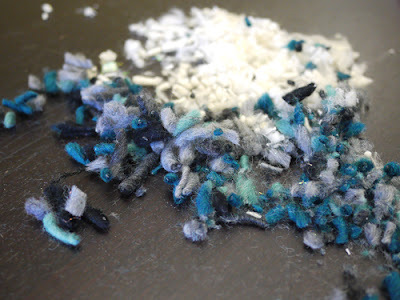 I helped make some extra pom-poms and breathed lots of yarn dust. 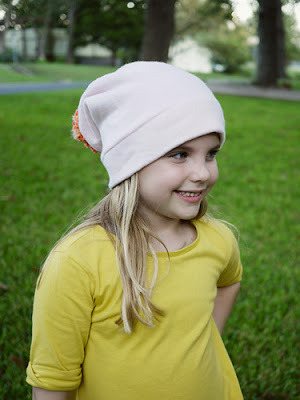 I watched Liesl modify patterns and demonstrate how to do a full bust adjustment. I tried on Allie's Washi Dress muslin and got some advice on how to modify it to better fit me (though I'm still undecided about that high waistline, which is why I haven't moved forward on that project since). I took time to check out what others were making, admire their skills and the beautiful things they sewed, chat about patterns, look at photos of cute kids and things sewn for them. In the end, I feel sure that I did make the most of my time. It was exactly what I needed. I left on Sunday feeling inspired and motivated, like I'd soaked up a bunch of creative energy from people who know how to create, and who make creating a priority. 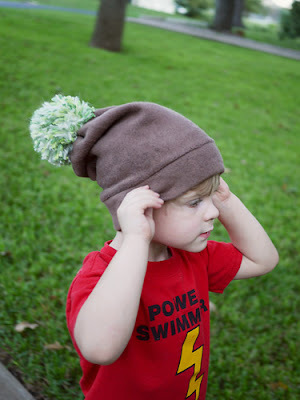 My kids loved their hats and have worn them as much as any kids can wear cozy hats in Texas. The kids have also loved hearing about NYC. They can't wait to go. I can't wait to take them. And to go back to some of those fabulous fabric stores. Until then, though, I'm trying to hold on to the creative energy I captured. I'm remembering the confidence I felt at navigating NYC by myself. I'm reflecting on the experience of learning from and getting to know Heather Ross and Liesl Gibson, genuinely kind people who are doing what they love, and doing it well. I'm thinking about all those ladies around the country (and in Canada!) 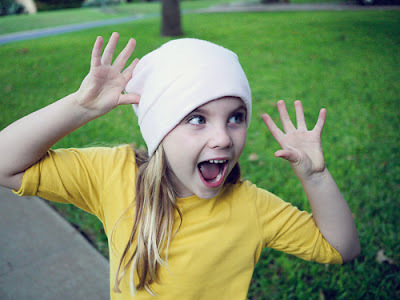 who are busy sewing amazing things, squeezing it into their hectic lives. I'm feeling inspired, dreaming of all that I want to make, and spending more time in my sewing room.